Our philosophy is to work more in the vineyards to respect the balance of the place. We like to produce a Brunello that represents the best tradition in structure and aromatics with more elegance, harmony and fruit. 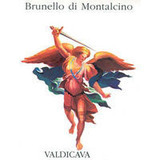 This Brunello opens with inky, dark concentration and ripe aromas of prune, plum and blackberry. It's packed tight with savory spice such as ground clove and cardamom and it also offers a full load of ripe (but not jammy) black fruit. It feels thick and textured on the palate with evident tannins that will soften with 5-10 more years of bottle aging. There's a touch of cherry sweetness on the close.